Born and raised in Moscow and with eight years of music on her belt, Marina V moved to the United States at the age of 15 to pursue her education abroad. A year later, she returned home to find it was in disarray when she discovered her parents were in the process of a divorce. That was when Marina set her sights on moving back to America. "I came to the US when I was 15 years old as an exchange student. I won a scholarship sponsored by U.S. government to study in America for 10 months in high school." At the age of 17, she finally was able to send herself back to the States. "It was very scary at first, since it was my first time away from home, first time in a foreign country where nobody spoke even a word of Russian," said Marina. "Plus, I was really young and my English was not all that great. With time my English improved, I made friends and fell in love with America and returned here when I was 17!" On her own, Marina met musician, Nick Baker. Baker inspired her to focus on music, so she sold her pick up truck in order to buy herself a piano and her career in music began to take shape. "I had a lot on my mind. I felt very guilty about leaving my family and my country, I was very lonely and scared trying to adapt to the new way of life. I was living with an abusive host family, commuting to college and working a few part-time jobs. I've had a number of terrible relationships and life-altering experiences of which I am not quite ready to openly talk about. Writing songs became my drug, therapy and my spiritual healer. It helped me come to terms with many things". Since 2003, Marina V has release five EP's, including her newest release entitled, My Star. My Star is much different because this EP reflects Marina's growth as a evolutionized artist. Since her first EP, Something of My Own, she has progressively improved over the course of her fairly young career. She has taken her haunting sultry voice and managed to not only improve vocally, but lyrically as well. The overall delivery of the harmonic balance of piano and acoustic guitar seem to compliment her brand of songs like her new single, "You Make Me Beautiful" and other notable tracks like, "Thursday Song" and "Killing My Dream", are a demonstration of her emense angelic voice that makes her stand out from other pop artists within this genre. Part of the reason you are able to pursue your dream, you have such a big fan following and not only are they listening fans, they are contributors. How did get your fans involved in your music? I consider myself a very lucky artist to have such amazing supporters. I always try to reply to fan emails and always interact and answer questions on my forum at marinav.com, and always try hang out with people after my shows. And maybe from the personal involvement, I feel that my fans are not just some random listeners, but my friends. Was it a hard decision to leave both your parents back home? My mom was divorcing my dad at that time and getting ready to leave for Australia. I had already spent 10 months in U.S. away from my parents, so I felt all grown up and independent. Little did I know how much I'd really miss them once I moved to U.S.. And not only my parents, but my little brother, and the rest of my family, my city and my culture. I went through a very tough time missing my family, crying almost every night, trying to figure out whether I had made the right decision.. Writing songs really saved my life. Why couldn’t you pursue becoming a musician in Russia? Why America? I don't really know why. Maybe because it wasn't common to want to be an artist in the middle of Soviet Union collapse. Things were very difficult, there wasn't even enough food in the early 90s, people didn't dream - they tried to survive. Maybe because when I was little, my piano teacher told me that my songs were "nonsense" and I didn't feel like my musical dreams were encouraged or nurtured in any way. And maybe because when I came to America, I really felt the presence of the American Dream. You have an interesting background. You’ve studied martial arts, skiing, and you have even played on a women’s hockey team, but somehow you chose a career in music. When did you know you wanted to be a musician? I was singing and writing songs since I was very little. It was always my passion. I just didn't realize until my mid-teens that I could pursue it as a career! Do you have any other passions besides music that you still enjoy when you’re not performing or recording? I love hiking and nature. I am an environmental activist (at least online) in my spare time. And I am learning to garden! And I love movies! So, how did you hook up with Guy Erez? Do you still work together? I met Guy through my friend Shannon Hurley, who had recorded with him. I was very impressed with his work with Gipsy Kings and Ryan Cabrera. with him, so we ended up recording the whole album! We talk on regular basis, and when I'm ready to record again, I'll be going to Guy! You have a distinct “Tori Amos” and the earlier works of Jewel sound. Is this by accident or are they singers that you’ve tried to emulate and build upon to create your unique sound? I love Tori Amos and Jewel. Jewel's song "You Were Meant for Me" and "Foolish Games" hit my musical mind like lightning, and inspired me to write even more! When you write music, do you write about your personal life? It's almost always personal - my songs are my emotional diaries. They are rarely specific lyrically, but almost all of my songs are based on something I have felt deeply. Out of your own library, what is your favorite song to perform? This is a tough one... It really depends on my mood each day. Sometimes I feel like I HAVE to perform a certain song, and it feels like my favorite. Which song represents you the most? In what way does it represent you? As humans, we all have different sides in us. And each song I write, is a little part of me. Recently you released your very first music video, “You Make Me Beautiful”. How excited were you to finally have your own official music video? It's very exciting - and I got very lucky with such a great director (Niva Dorell) and a 2-time Emmy-winning editor, Schultz! I'm very proud of this video - and we shot most of it in 1 night, from afternoon til 8am the next morning! I was downloading photos of you for the print article and I notice that you performed at the Kodak theater. Was that a highlight of your career? It was wonderful to perform at the Kodak Theatre, it was definitely a very magical and fun evening. At what point did you feel like you truly made it as a solo artist? When I got recognized by a fan in a shopping mall and she asked me for an autograph. Do you ever think you still have a lot of work ahead of you before you get national recognition? There is always a lot of work ahead. Even the most successful people will tell you that once they become very very successful, they have to work almost as hard to keep it up and stay successful. I love doing what I do and hope to have the strength to keep working the way I want to. Have you ever been nominated for a music award? How close did you come to winning? I've been nominated for Hollywood Music Award twice, last year for music video and this year for one of my songs. Didn't win. So, are you currently working anything juicy that you are dying to let people know? Or perhaps a new video or even a major tour? 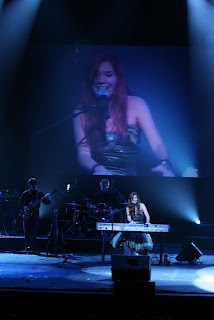 A few things are in the works, so keep checking at http://www.marinav.com/ ...My fans would be the first to know! Marina is an amazing talent!! I've been following her for 6 years, and she just gets better and better!! !